Nuts are excellent sources of many nutrients and are worthy of being included in most diets on a regular basis. Peanuts are a legume but are classed as nuts. Nuts provide protein and are a source of dietary fibre, as well as contributing many vitamins and minerals. They also provide a range of antioxidants that may be valuable for health. Some people avoid nuts because they also contain fat. However, the fats in nuts are predominantly either mono- or polyunsaturated, often dubbed ‘good’ fats. Many studies attest to nuts being beneficial to health, with special benefits for heart health. Coconut and palm nuts are different in that their fat is mainly saturated. Saturated fats are a recognised risk factor for heart disease. Being plant foods, nuts (like all plant foods) do not contain cholesterol. Because of their high kilojoule content (due to their fat) nuts should be eaten in moderation as part of a healthy diet. Chestnuts contain very little fat and have less than 30 per cent of the kilojoules of other tree nuts. A small handful of raw, unsalted nuts (about 30 grams) makes a satisfying, nutritious snack and studies show many health benefits. Lower cholesterol: Eating nuts regularly can lower your LDL-cholesterol – the so-called “bad cholesterol”. Weight: Despite their high kilojoule content, nuts can be a useful component of a weight loss program because they satisfy the appetite. Because of their high satiety value, researchers sbow that consuming nuts does not lead to weight gain. Diabetes. Studies show that people who consume nuts, especially as part of a Mediterranean diet, have a lower risk of developing type 2 diabetes. 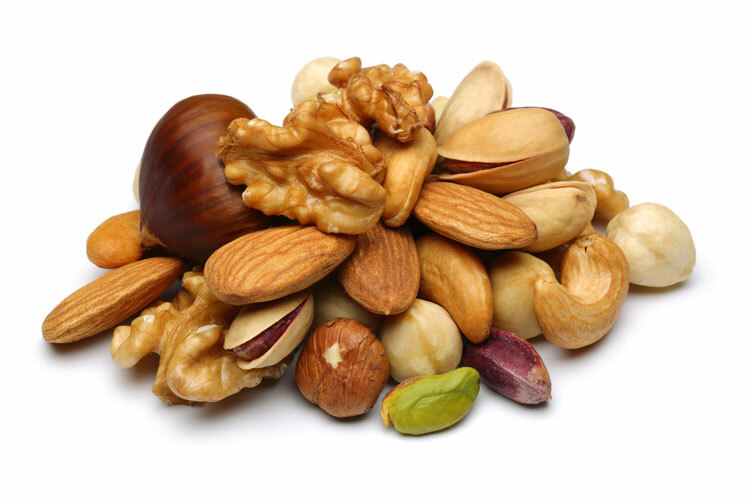 Heart health – arteries: Nuts are rich in vitamin E and magnesium, which can help keep arteries supple and help reduce the risk of heart disease. Other compounds in nuts, including arginine and some naturally occurring plant sterols, may also assist with heart health. Almonds are high in calcium. Brazil nuts are a particularly rich source of selenium. Pine nuts are high in iron and zinc. Pistachios are a good source of potassium. Macadamias are high in manganese. Walnuts provide an omega 3 fatty acid called alpha linolenic acid. To get the best array of nutrients, choose a variety of nuts. Unsalted raw or dry roasted nuts are the best choice. When nuts are roasted, their flavour is more intense and they are more crunchy, however, salt may be added, which could negate some of their health benefits. Due to their high content of unsaturated fats, nuts can become rancid quickly and develop an unpleasant ‘sour’ taste. It is important to buy them fresh. Store shelled nuts in sealed containers in a cool place. Most nut bars will not have the health benefits of raw nuts, because they contain ingredients such as sugar, honey, cereal, processed fruit pastes, fats and various additives. Despite all their health benefits, some people are allergic to nuts. This can be to any one or more of the tree nuts, such as almonds, Brazil nuts, macadamias, cashew nuts or pecans, or to peanuts. Nut allergy seems to be on the increase in Australia and people who are affected should carry adrenaline prescribed by their doctor. 1. National Health and Medical Research Council 2013. Australian Dietary Guidelines. http://www.eatforhealth.gov.au/sites/default/files/files/the_guidelines/n55_australian_dietary_guidelines.pdf (accessed Sept 2013). 2. Nutrition Australia. Nuts and health. Last revised Dec 2009. http://www.nutritionaustralia.org/sites/default/files//Nuts_Printable%20Detailed%20Summary_0.pdf (accessed July 2013). 3. Dietitians Association of Australia. Nuts. http://daa.asn.au/for-the-public/smart-eating-for-you/nutrition-a-z/nuts/ (accessed July 2013). 4. Mayo Clinic. Nuts and your heart: Eating nuts for heart health. Last updated Feb 2011. http://www.mayoclinic.com/health/nuts/HB00085 (accessed July 2013).